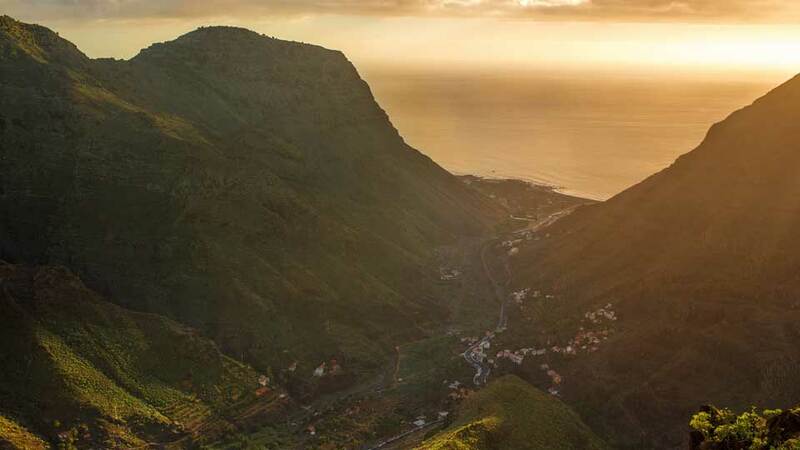 Perched on a large ravine with excellent views of the Atlantic Ocean, Valle Gran Rey in La Gomera is a visitor magnet. With its stretch of black sand beaches and blue waters, it’s no wonder why this former fishing village is now a top tourist destination on the island. This town resort, situated on the island’s west coast, has a human population of over 4,000. Traditional villages cascade down the mountainside to the ocean, a view that can be best appreciated from the stunning coastline. The waters and the underwater wonders of La Puntilla and La Calera are the favorites among scuba divers. Other shorelines along this former island capital include El Charco del Conde, Playa del Ingles, Las Vueltas and El Charco de la Conde. Each of these beaches boasts unique qualities, from calm water to campers and surfers’ paradise. Although the coastline is dotted with many locals and tourists, it’s amazing how Valle Gran Rey maintains its tranquil ambiance. This town is a perfect holiday destination for those wanting to take a break from the buzz of the crowded spots on its neighboring islands. The coastline of Valle Gran Rey features several kilometers of volcanic sand beaches. Visitors will surely find their cup of tea with the plethora of beaches available with different water conditions. This beach, being the longest shoreline along the beaches here, is well-loved by many locals and tourists. Playa de Valle Gran Rey attracts millions of visitors all year round and is an impeccable place to embrace beach life. With a perfect balance of flora and fauna, visitors can easily find any spot for sunbathing. Some also enjoy watching the sun kissing the Atlantic Ocean goodbye in all its glory. In the morning, guests can start energizing their day by playing beach sports such as volleyball. Steep rocks border Playa de Ingles and are the reason why it is popular among the nudists. They find privacy in the small streams of water found between the huge rocks. Tourists should be extra careful when diving deep because Playa de Ingles tends to have strong currents. Nevertheless, it’s a must try for visitors who love adrenaline-rushing water activities. Charco del Conde is one of the most family-friendly beaches in Valle Gran Rey. Charco del Conde is a small lagoon protected from large waves and currents. Toddlers can paddle and swim here without the worry of deep waters especially during the afternoon when the sea is at its calmest. The fine black sand dotted with tiny seashells is also perfect for sand castle building. It is believed that the Conde or Count of the island used to swim here with his entourage, hence the beach name. His wife, on the other hand, swam with her escorts in Charco de la Condesa, a nearby shoal. Playa de Vueltas is one of the largest in the municipality. This black sand beach is family-oriented since it is located inside the port’s dock and has no big waves or strong currents. Visitors who are searching for seclusion and some quiet time with nature will find refuge in Playa de Argaga. A meditation lounge is situated at the center of this peaceful beach. At night, the natural breeze of cold wind is a perfect company for stargazing and bonfire activity. Please note, however, that there have been instances of falling rocks in the area. Valle Gran Rey beaches have more than enough hotels and apartments to accommodate visitors and tourists all throughout the year. Most of them are conveniently located only a few meters from the seashore. From fancy and modern hotels to homey bed and breakfast places, Valle Gran Rey has it all. Hotel Gran Rey is a modern 3-star hotel is situated near the beach, shopping area, local restaurants, and cafes. Its great location and modern amenities make it a favorite among visitors, especially for first timers. Each comfortable room is air-conditioned and features a balcony with sweeping views of the ocean. The in-house restaurant with its tantalizing gourmet cuisines is also noteworthy. Imagine having a full suite, with kitchen and balcony, right by the sea. These are what tourists get when checking in at Charco del Conde. This family-friendly property is only 3 minutes walk from the beach, features an outdoor pool, mini golf, and a lovely garden. The location of Punta Marina Apartment, just 2 minutes from the beach and right in the center of everything, is top notch. It has clean and comfortable rooms, as well as well-manicured garden and an outdoor pool. This complex is perfect for couples and families. Valle Gran Rey has a broad range of beachfront restaurants featuring different cuisines. The promenade is dotted with quaint restaurants and cafes that are perfect for after-beach meal or drink. Dubbed as the best restaurant in town, La Salsa offers a delightful fusion of local and international cuisines for dinner. The food is well-regarded by locals and tourists, plus the restaurant ambiance is very relaxing. Vegetarian and gluten-free dishes are also served here. Situated right on the beach, guests can savor the taste of their dinner while enjoying the lovely ocean views. At a reasonable price, the restaurant features Mediterranean, European and International cuisines. There is also a full-stacked bar where guests can sample local wines and beer. 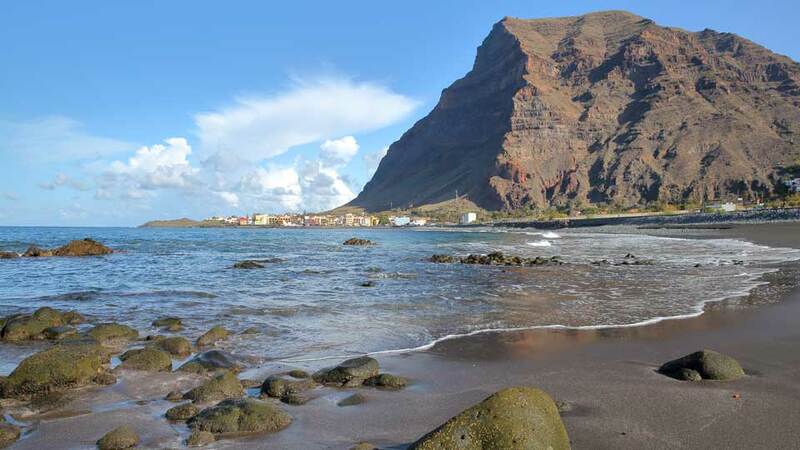 At Charco del Conde, visitors can enjoy a sumptuous meal without heading far from the waters. This restaurant with outdoor seating offers mouthwatering Mediterranean cuisines from lunch to dinner. There are no airports yet on the island so guests must ride a ferry to San Sebastian. From the port, it takes about an hour or so to drive across La Gomera and get to Valle Gran Rey. This does not include the stops visitors can’t help but make at the many interesting lookout points along the way. Visitors driving on their own may rent a car from the port. Take the GM-1, CV-14, GM-2 then GM-1 motorways to get to Valle Gran Rey. Once at Valle Gran Rey, it would be easy to navigate on the sign-posted roads to get to the beaches. For a more convenient and cost-effective option, visitors may take the bus that departs four times a day to Valle Gran Rey. Please note that the bus service is limited and takes almost 4 hours to get to the town. Guests visiting Valle Gran Rey beaches must plan ahead of time. Once a sleepy fishing village, this town is now a bustling holiday destination. Reserve a hotel or apartment room a few weeks before the visit. Don’t forget to pack swimsuits and sun protection, guests will have more than enough of waters to dip into and sandy beaches to laze on. Lastly, bring along cameras and extra batteries to ensure that the holiday is well-documented. Visitors’ gadgets will surely never run out of land and seascapes to capture. Being able to visit destinations like the Valle Gran Rey in the Canary Islands is such an incredible experience many cannot afford. Tourists from all over the world prefer the big and bustling islands Gran Canaria and Tenerife instead of the La Gomera. It’s both a curse and a blessing to the island, especially for Valle Gran Rey. The isolation and tranquility of this coast are what most of the visitors crave for, and they are never disappointed. At the peaceful coast of this town, visitors can have fun, witness the sunset and feel like a world away from the worries and realities of life.